This party season, you can accessorise with vintage jewellery. Bangalore-based costume designer and wardrobe stylist Sankeerthi Aipanjigulya��s brand of jewellery, Rabbit out of the Hat, will now be available at Chennaia��s Shilpi. Come Saturday, and you can lay your hands on beautiful pieces that Aipanjiguly collects from around the world. It was a passion that began when Aipanjiguly and her sister sourced rare pieces of jewellery for themselves on their travels to Ghana, Morocco, Uzbekistan and Yemen. They eventually decided to make these pieces available to others at an affordable price via their Facebook page, launched in May this year. a�?Usually, when you say vintage jewellery, everyone thinks it is very expensive. We wanted to break that idea,a�? says Aipanjiguly, who initially travelled to source her jewellery. She now has local people to help out. a�?I choose something I would wear personally. I look for exclusive designs, something that catches the eye,a�? she says. What makes Rabbit out of the Hat different from others featuring vintage jewellery is that her pieces are globally sourced and each has a story. a�?Therea��s jewellery made from recycled beads from Ghana or an Indian silver anklet worn by a Russian circus performer, sold to us by her grand daughter for Rs 25,000,a�? she confides. Others come from different tribes in Asia, Africa, Morocco, Afghanistan and so on. Small traders from different villages buy them and they then reach Aipanjiguly. a�?These traders usually go from house to house buying old things. So quite often, it is not even complete jewellery but pieces of it that are converted into something else,a�? she explains, referring to a headdress from Yemen that is now a necklace, or a large earplug that is a finger ring. a�?The quality of silver varies from place to place,a�? she says, adding that some of the jewellery comes with brass or glass inlays or with semi-precious stones. a�?They make for heirloom pieces and one heavy piece will suffice to complete your look for a night out,a�? she says. Thanks to Bollywood stars like Sonam Kapoor pairing such jewellery with western outfits and Deepika Padukone wearing heavy Kutchi earrings in Ram-Leela, the look is only going to get hotter. 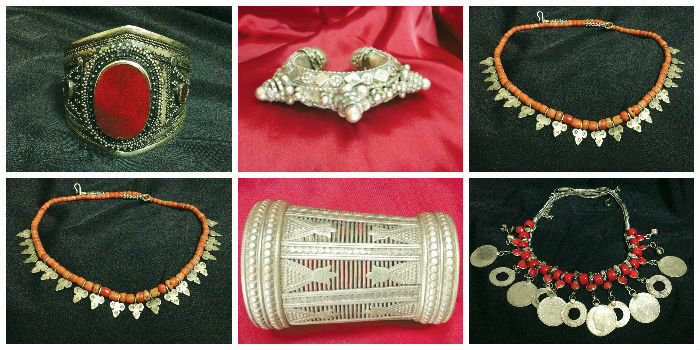 Apart from the lovely silver jewellery, you could also head to Shilpi for trendy winter wear. They have a smart collection of cotton and tussar silk skirts, cotton and silk kurtas, jackets and embellished blouses for pavadais. There are some pretty stoles and scarves to protect you from the chill, too. Price from Rs 3,000 to Rs 12,000.